In golf as in life, it is the follow through that makes the difference. 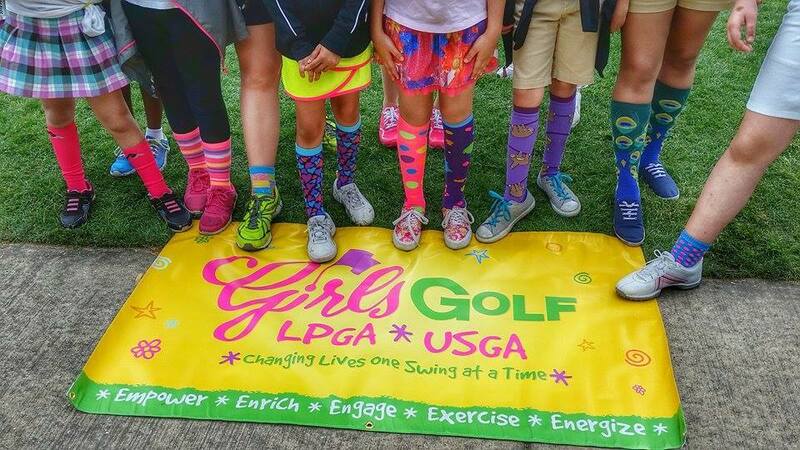 LPGA*USGA Girls Golf is the only national junior golf program that specializes in providing girl-friendly environments for juniors to learn the game of golf. As a Girls Golf Site Director since 2003, I help prepare girls ages 6 – 17 for a lifetime of enjoyment of the game while also inspiring them to feel confident and live active and healthy lives through The Five E’s of Girls Golf (Empower, Enrich, Engage, Energize, and Exercise). All Girls Golf Clinics are 75 minutes. Each clinic includes 45 minutes of instruction/games/contests as well as a 30 minute craft. Why include a craft in a golf clinic? It serves to break the ice with newcomers and adds a social element to what is typically an individual sport. Other than safety, the most important ingredient to a successful youth sport experience is fun. 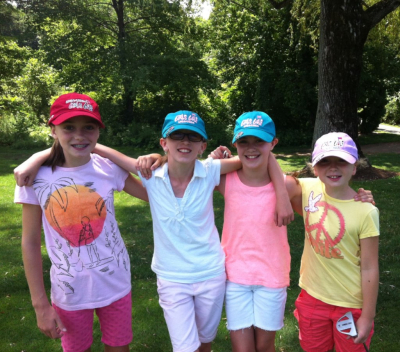 All of my Girls Golf Clinics are designed to make the experience of learning golf fun. There are two clinic times per date. The first clinic time is for our younger members (age 7-11). The second clinic time is for our older members (age 12-17). There is an overlap of 15 minutes between both clinics for all of our Girls Golf members to connect with one another. Please enroll as a National Girls Golf Member online prior to registering for individual clinics at Tallwood. 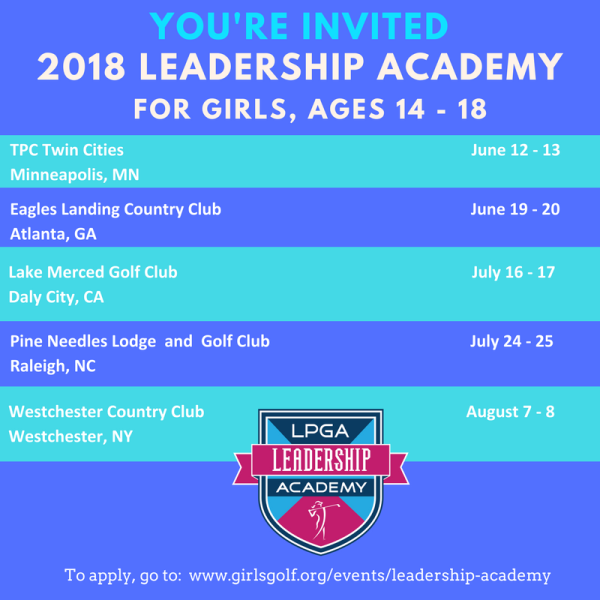 As a member of Girls Golf, you will receive fun logoed golf merchandise, and are granted free entry to LPGA, Symetra Tour, and USGA Championships. Enroll as a National Girls Golf Member online. It's simple and FREE. Choose Girls Golf at Tallwood CC as your site. You will receive Girls Golf membership gifts! Choose the clinics at Tallwood you would like to attend. Mail your clinic registration (download from this website) and payment. In the fall of 2017, Meghna was chosen to represent the First Tee of Connecticut at the First Tee's Leadership Academy. As part of this experience, she was asked to speak about the core value of honesty. The week culminated with Meghna receiving the National Outstanding First Tee Participant Award and a $20,000 college scholarship. Way to go Meghna! I am so very proud of you and thankful for your service as an E Leader with my Girls Golf site, inspiring other young girls to strive for excellence. take calculated risks and "Lean In"
Dinah Shore Scholarship: granted annually to a female high school senior who is pursuing a college education, but will not be playing collegiate golf. One $5,000 scholarship is awarded each year. Marilynn Smith Scholarship: awarded to high school seniors who will be playing collegiate golf. Twenty $5,000 scholarships will be awarded annually to the most highly qualified candidates. Phyllis G. Meekins Scholarship: a need-based award granted to a high school senior from a recognized minority background who will be playing golf at the collegiate level. One $1,250 scholarship will be awarded annually.